Louise Powers felling her first tree! Just a quick note to say thank you for organising a brilliant course. 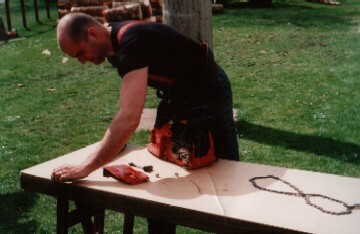 I was very apprehensive about doing this course as I haven't used a chainsaw. It was Phil's teaching technique that built my confidence and helped me pass on Saturday All I can say is a big Thank You Hope to see you at one of the shows. Very nice to meet you last week. Many thanks for sorting all the arrangements for the course and assessment. Please also pass my thanks on to Phil. His knowledge and enthusiasm, combined with his ability to get the facts across, made it a very informative, enjoyable and successful (if tiring!) week. I felt well-prepared for the assessment after Phil’s instruction, demonstrations and guidance - and the end results proved this to be the case. 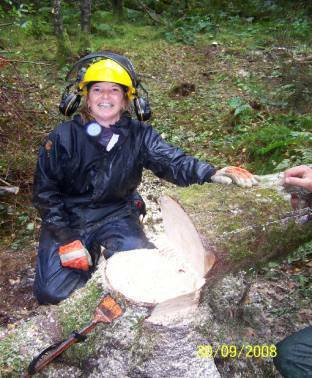 Thank you once again for presenting an excellent course last week and providing everything from tea and biscuits to a solid grounding in using and felling with a chainsaw, giving me positive confidence in its use, safety and maintenance. I’ll hopefully be using the developed skills again in the not too distant future and will definitely look you up for any future training requirements. I also won’t hesitate to recommend you to others, even though you’re a little off the beaten path, it was well worth the journey. Please also pass on thank you’s to Karen for her behind the scenes work at ‘team Dunford’, and to Tony for his down to earth patient assessing on what must have been quite a stressful day for him. We were all winners on the day and a good experience had all round. Just wanted to say Thank You to you and Phil for the excellent teaching I had at the start of the week. I learnt such a lot in a short time and having got Baz (husband) to start my saw for me I've cut a load of logs this afternoon. I have changed my sharpening gauge at J.T. Williams and bought a stump vice and told them what a brilliant set up you have for training people at Tyn Y Graig, as it was them who recommended you to me in the first place, so hopefully they will continue to do so. If someone had told me that I would find watching 10 minute videos of people snedding (badly I might add) on You Tube fascinating I would not have believed them but I have seem to have caught some strange chainsaw bug while I was being trained and I have watched a few chainsaw videos this week, quite sad really!